Pretty In Pink… The Pink Panther... Other than being movies, what else do they have in common? How about the color pink!?! This week at Limelight Papercrafts we are focusing on all things pink… with one exception… it must sparkle, shimmer or shine! We want to see your pink bling!!! Stickles, Shimmerz, Kaisercraft Rhinestones, sparkle fibers… You name it, Limelight carries it and we want you to use it! Don’t have any that we carry? Use the bling you have, just make sure it’s pink! We can’t wait to see what you come up with! Of course, I'm bad and didn't re-read the challenge guidelines until AFTER I finished my card, but I did get pink bling on it! And the satin ribbon is shiny, so it counts, yay! Hope you get to play along! **Sketch and Product Challenge with a focus on using pink bling. **Uploads to SCS should have the keyword: LLPC014. **Participants should post a comment and a link to their card on Mandy's blog. All entries must be submitted by Sunday, February 8th , at midnight to win a jar of Shimmerz and package of rhinestones of the winning designer's choice! Very pretty in Pink! I love the bling and your ribbon is so cool looking. just lovely! 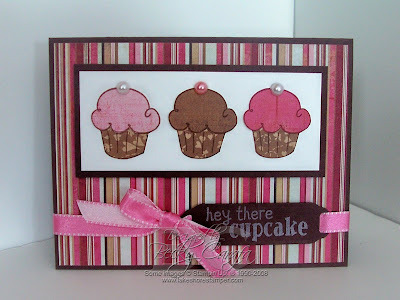 great pieced cupcakes and that paper is just yummy! This card is adorable Becky!! How cute! Love your cupcakes and the paper piercing you did, they are fabulous. Great job! Cute Cute Cute!! Love the striped DP! Your card is Yummy! Love the cupcakes, and your bling is perfect. Great card! Darn, look at all those yummy cupcakes!! They are making me hungry!! LOL! 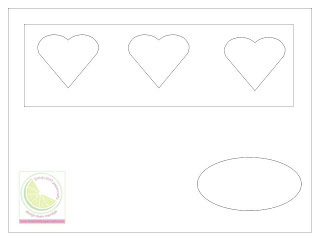 Love your card with the cupcakes in a row. Hey, pink and brown combo is the color of the day...seems like everyone is using that combo!! Well, your card turned out beautiful and you did such a fabulous job coloring the image!!! Great sketch too!! Oh those cupcakes look scrumptious!!!! I love the pearls on top!! This is just adorable!! I love the cupcakes and the pink ribbon and sentiment! Great job! Yum - can't go wrong with cupcakes! Great job Becky - they look adorable! Love this - too cute!!! Yummy ribbon and pearls on this one!